I had a decent result this weekend at the first ever Brighton Stage Race. It started with a TT on Torn Shirt at noon on Saturday. The tight and twisty trail made for some close times. I ran a clean run until the end of the third re-route where I hit a 1ft tall stump, stalled, and fell over. I got back on, but my chain was off and I was on an uphill. I jumped off, put the chain on, and then I was on my way. After that I felt like I was flowing pretty good throught the trail. I finished it off in 29.06 in 6th place. There was only something like a 6 second spacing between 4th place and 7th place, so it was all close. The short track was on the open grassy area in front of Bishop Lake. I was blown away from the get-go as my starting power blows. I was pedaling hard, but the legs just seemed to not have the power in them. After about three laps, I felt better and started picking people back off again. In the end, I came in 12th place out of the 16 that raced. Not a great result, but the short track is shorter, so I didn't lose too much time. Oh, I was also one of the geniuses who rode and additional 7th lap! I was playing follow the leader. At the end of the lay, I sat in 9th overall in the stage. Sunday morning brought the cross-country race with 5 laps of a shortened Murray Lake with some extra grass, two-track, and gravel road. Again, I think almost everyone went by me by the time we hit the single-track, but I started picking racers off. After lap 1, I rode the next three laps with Dan K. at a good pace. I was a little stronger on the hills, but he can shred the singletrack, so I sat behind him and learned how to ride. By lap 4, I was cornering much better and moving my weight around. For the three laps I rode with him, we could see Bill Clikeman back about 15 seconds, and we kept on pushing. Finally in the middle of lap 4, we didn't see him, but knew he was not too far behind. On lap 5, I took off and rode a good lap. I kept it flowing and pushed it hard. I clocked my fastest lap of the day at 27:42 on the last lap, and came in at 7th place. Maybe I could have gone a bit harder on a few earlier laps, but I was happy with my race and I got a riding lesson, so I am sure it will all pay off. 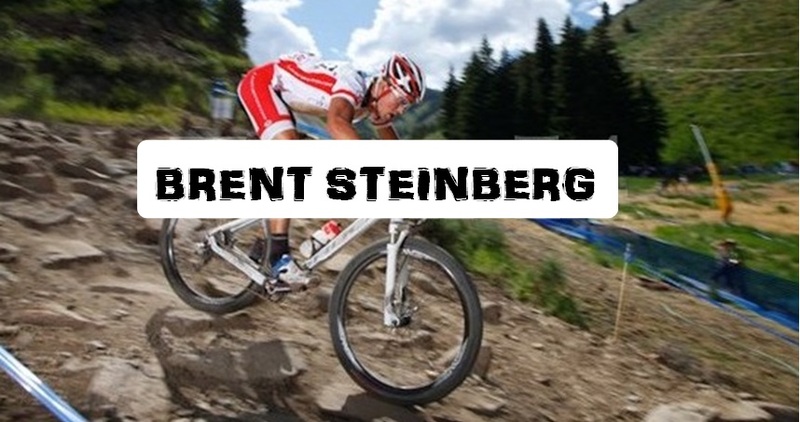 That put me in 7th overall for the stage, so not a bad weekend of racing. The Brighton Stage race is almost here. The last two days have been crappy weather with on and off rain during the day. I was able to ride out to Brighton Rec today and check out the trails. They are in great shape. There is no mud, and they are not a loose as I have seen them lately. The surface is tacky and should make for some fast races. The new re-routes in Torn Shirt have gotten better and someone made a new re-route on the third re-route where the tight switchback was. Now there is a turn before it and the logpile that threw riders into a tree has been taken out. I spent just under 4 hours trimming the first 4 miles of Torn Shirt. It was starting to get really overgrown and there was a lot of low hanging branches ans trees/bushes. Especially in the middle grassy section of the trail there was a lot of stringy bushes and pine trees that took a while to cut back and get off the trail. The remaining 1.5 miles of trail isn't nearly as bad as the first 4 miles, but there are still a few low hanging branches people should watch out for. I stashed the loppers in my Wingnut hydration pack and rode the rest of the trail. With these conditions it should be a fast and FUN weekend. been away from this thing for a while, and it is time to get back at it. After the Greenbrier race, I took a good week of riding and topped it off with a trip to the Fort. 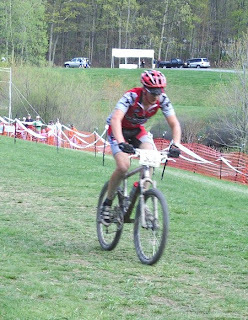 Did not race, but rode a bit on Friday and Sat and supported on Sunday. The parents raced and finished in their sport classes with a 5th and 6th. From there it was back home and time for more riding. I hit up some new places and routes in the past few weeks. I rode to Proud Lake and did all 4 loops a few times. Some good trails with decent climbing. Nothing technical, but it is all up and down. I also did a ride from my house to the Poto. Just over an hour later of dirt roads and Lakelands rail trail, I was there. But, the trail was soaking wet. They must had gotten much more rain than us, since Murray Lake and Torn Shirt were in great shape on my way back home. 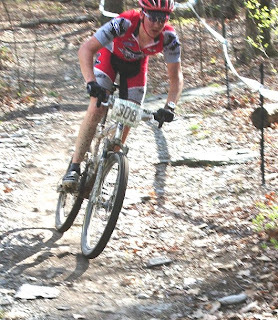 I did those trails at Brighton Rec a few times in the past week to get ready for the Stage race this weekend. It should be a blast and the weather looks to be perfect for it. I am going out there again tomorrow, but not to ride, but rather to trim the trail on Torn Shirt. Some of the middle section is fast, but branches and bushes hanging out in the trail make it not so enjoyable. I am looking foreward to all races, but most importantly, where the Short Track race will be. Here comes a half hour of pain!!! I have looked at my schedule and have planned it out for a while. After the stage race, I will start working towards getting ready for the USA Cycling Nationals in VT and then the NMBS race in NC. Those are at the later/end part of July, but I have some events before that. 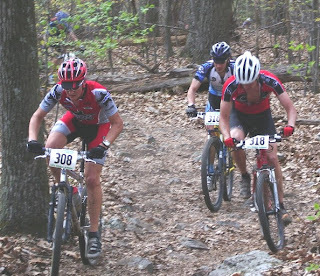 I am thinking of racing the Hanson Hills race for training in a few weeks since I will be up there anyways, and then the next event is Lumberjack. Thats mid-June, and the next week is a little family weekend trip up to the sand dunes, so my road bike will be in full on climb mode as I'll ride the best roads in (lower)Michigan in Leelanau County. After that is the Stony Marathon, and that is it before the big races. It will be a jammed packed few months of pain, and I am looking foreward to it! I spent Friday, Saturday, Sunday, and Monday over on the east coast playing in the rocks. Did two laps of the Greenbrier race course on Friday to get the legs up and running after 8 hours in the car. The course was not something you would find here in Michigan. It started off going uphill about 75 ft before leading into a screaming fast flowing descent that was all about jumping over the water bars. This quickly led into a full on rock infested dowhill that had multiple turns. The line changed almost every lap with rocks getting moved over by tires and others coming out of nowhere. You had to keep the eyes up and tires down. I sucessfully made it through all times and it was a blast. You don't get that kind of adrenaline here. The cousr shot out onto a gravel(all stone, no dirt) trail that eventually turned and went through a creek 20-30ft wide and about 6-8" deep. There was then a small climb and some mud pits. After that section is where the fun began. A 1 mile climb with 350ft of climbing which is very steep and rocky for the first half before becomeing more gentle with the grade. I made it in the middle ring both laps, but in my smallest gear 32-32. I figured for the race with legs working hard before the hill, I might want a smaller gear, so I put on the granny later. The trail goes into a low grade before another fast swooping downhill. Then climb number 2 which consists of all rocks where you have to pay attention and pick lines carefully. It goes up 275 ft and finishes on top of a ridge. You quickly hit some moderate downhill before the best downhill. It screams down over rock, between trees, over roots, water bars, shale, and of course a few thick mud pits before wrapping around the lake to finish the 5.7 mile loop with 735ft of ascent. Rode a lap on Saturday to keep the legs fresh, then chilled the rest of the day and went to Hagerstown for a bit while it rained. Sunday was race day, but I had to anxiously wait all day until 3:30 before the gun went off. So, I sat and watched the racers go down the last downhill all morning. Our campsite was right off the trail, so we sat and watched all categories go through. The at 1:20, I saw the UCI Elite/Pros go through a few times before it was ready to stretch and warm-up. Finally the race was off, and I found myself in a 3-man pile-up in the first gravel corner 15 seconds in. Some guy biffed it and 2 of us couldn't stop in time. I kept my legs planted to the ground, but the bike fell below me. Not bad, I put the waterbottle back in the cage and was off. Oh, off dead last out of 21! I passed 3 or 4 people before the first climb, where I climbed it while going by 4 or 5 others who were all walking. Then found a line of 6 or so who riding together. 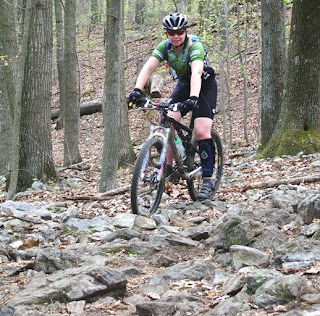 Go to the second big rocky climb and picked my line well while going by more riders. I was just about to the last downhill when a guy passed me. He wasn't too slow on the downhill, but he slowed before the big mudpit, which eventually got me coated from head to toe. Lap 2 I quickly passed the rider in front of me on the first climb. I rode the rest of the lap by myself picking off Semi-Pro racers on the climbs. I flew down the last descent not even knowing what I was hitting. I just grabbed the bars and let it roll. Early in lap 3 I passed the second place rider from Trek/VW East and never looked back. I just kept my pace up and went with it. I had to jump off for a quick bit on the steep climb when I got caught behind a rider. I ran up a bit, tried to start but couldn't. Run somemore, then finally got on and rolling. This costed a little time and showed to be my slowest lap. Lap 4 I was passing more Semi-Pros, lapping later expert men and women, and I just kept it up. i amde the steep climb again, and just kept the power going. Came in the finish shoot after my 4 laps in 2nd place. I was happy with the finish. I rode well, paced smart, and tore up the downhills. It was extremely fun. Since the award were over after 7, it we knew it would be late getting home, so we had decided earlier that we would stay Monday. So we rode a nice lap and checked out the scenery before driving the 8 hours home. Good trip, great event, and I might have to come back again.